With our longest days – and, we hope, harshest heat – behind us, we’re all looking forward to fall. But if you just can’t wait, why not head up to the mountains, where the breezes are already cooler, the nights and mornings breathable? Soon, of course, the colors will start changing, and if you haven’t been up there in a while, you’ll be pleasantly surprised at the rapidly evolving food scene. Take, for example, Blue Ridge, with a mini-explosion of small breweries, a bona fide Internet sensation (the previously little-known Joe’s BBQ, which confounded many with its sudden coronation as best barbecue in the country by the reader-reviewers on TripAdvisor) and several recent entries on the more sophisticated dining scene. Probably the most high-profile of the bunch, Harvest on Main occupies an imposing, rustic-cabin-style space on Blue Ridge’s tourist-friendly Main Street. Chef/owner Danny Mellman, who earned numerous awards at his coastal Florida restaurants, was also one of the area’s pioneers in using local meats and produce in innovative dishes. Opened in January 2010, Harvest on Main’s soaring exposed beams house a dangling old canoe; an enormous, 12-point elk head protrudes over the stacked-stone fireplace that surely crackles to life in cold weather. Wood floors creak underfoot. The design has become so commonplace you could be in a Ralph Lauren store as easily as a foothills lodge. Still, here it reminds you where you are – specifically in the mountains, and likely on vacation. The food fits the bill for exactly that, with a menu that embraces picky eaters and more adventurous diners. On the early side for dinner, I was struck by how many families packed the space – and how well-behaved the children were, as if somehow equally awed and entertained by the environment. They chowed down on flatbread pizzas, hot dogs and mac-and-cheese, or semi-boneless pan-seared Springer Mountain half-chicken and Brasstown Farm meatloaf. Meanwhile, their parents sipped big glasses of cabernet sauvignon with their steaks and pasta. The restaurant’s sheer volume of dishes and drinks is impressive, but not overwhelming – and the waitstaff is incredibly cheerful and helpful in making choices. Our server seemed attuned to our vibe right away, volunteered to fetch multiple tastes of wine and helped us sort through the multitude of options. 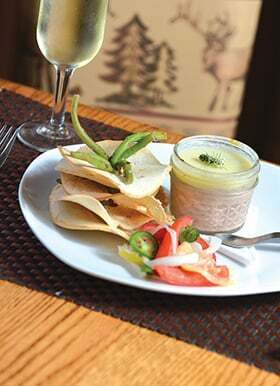 The food is friendly without being dumbed-down – the pâté sealed in its little jar with schmaltz is described on the menu as “smashed chicken livers.” Cool and bourbon-scented, they smear smoothly over crisp pita chips, served with the cold house “dilly” green beans. It went nicely with a well-crafted Pisco sour, a classic cocktail with Peruvian brandy, its sweet-tart edge mollified by whipped egg whites. I’m thinking: This is Blue Ridge? Yes. Yes, it is. So is the lightly dressed tangle of tender local lettuces as well as the Arctic char, a trout-like fish served in a nightly special over garlic mashed potatoes with a chorizo and scallops cream sauce. The duck was, to my taste, just a little over-much – seared and served over pecan-flecked mashed sweet potatoes and sautéed red cabbage with house-smoked bacon, with a big patty of merguez (lamb sausage) on the side. All it needs is a sautéed cherry on top. Which it has. Several, actually. The weather was still too warm for me to enjoy this kind of dish, but I could see craving it on a bone-chilling winter’s day, like a big stack of pancakes. Desserts are crowd-pleasing, ice cream-topped, nut-sprinkled, caramel-laced goodies that are surely meant to be shared – but I could barely make a dent in Miss Patty’s Chocolate Cake (with pecan caramel cream cheese mousse) after that significant dinner. Lesson learned: You can actually eat too well in Blue Ridge. We’ll have to return to correct our error.